waste of money or a blessing." 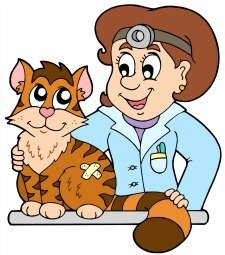 This page has my pet insurance tips to help you decide whether to buy a policy for your kitty or other pet. A policy can come in handy to take care of your ailing cat or other pet, but it can also be a waste of your money. In a way it's a bit of a gamble, but it's something you should at least make an informed decision about. You may also want to consult with your veterinarian and other pet owners to ask about their experiences, and for recommendations for particular companies. What Bills Will Be Covered? Policies will almost never cover your entire veterinary bill, although it could make a substantial dent in a hefty bill. Some veterinary costs will be not reimbursed and others will be excluded entirely. You will also have to pay deductibles and co-payments in addition to your ongoing premiums. And if your kitty never becomes ill and you never use your policy (which is what you hope for! ), then you have nothing to show for your money (except for maybe peace of mind). How About a Special Savings Account Instead? For some people, a policy is really nothing more than a forced way to save money for your cat's veterinary treatment in the event that he or she is injured or becomes ill. The policy could end up costing you thousands of dollars in the course of your kitty's lifetime. This money could be yours if you take the pet insurance tips of some consumer advisers and put the money that you would pay for a veterinary coverage policy into an emergency savings account. This account should be for the express purpose of taking care of your feline friend or other pet in the event of an emergency. This way, the money belongs to you and not to the insurance company. Of course, this takes discipline and it doesn't help you if your kitty needs expensive veterinary care before you've had a chance to save enough money. According to some statistics, less than 1 percent of pet owners have pet insurance. And yet, for some caregivers who don't have the money to pay for treatment if their kitty becomes very ill, having it can be a huge blessing. A policy helps to take some of the financial pressure out of the decision about what to do for your pet when you are faced with a serious health crisis. This emotional security is a good enough reason for many people to take on this added expense to pet ownership (or "parenthood!"). The final decision about whether to spend money on insurance should be weighed carefully. And even if you decide that it does not make financial sense for you to buy a policy, it may make enough emotional sense and provide you with greater peace of mind. Regardless of any of my pet insurance tips, your own feelings should guide you best, even more than your bank account. If you decide to shop for a pet insurance quote for your kitty, be sure to read the fine print and ask questions until you are satisfied that you understand what your policy covers. These factors should be clearly stated, but if you have any doubts, ask for more information until you are satisfied. Hopefully, the above pet insurance tips will help you to make the best decision for you and your family. Take a look at my page on common cat health problems to read about the type of diseases and illnesses cats are susceptible to.